As the holidays approach, we polled our members to see what the most sought-after tools and gadgets are this year. Read below for inspiration to add to your own list, or to buy for your loved ones! After 73 days, MozART's performance has come to an end. It's time to take a look at the data and see what Lynchburg residents are playing and when they're playing it. MozArt painted a total of 280,472 notes, all of which you can be found in its log file. I want to understand more about the notes that were played. Was there a popular note or a popular time to play? How many people played these notes? Were there any strange patterns in the data? Some of these questions are easier to answer than others, but let's give them a try and see what we can learn. The plots below are generated using Python and matplotlib. 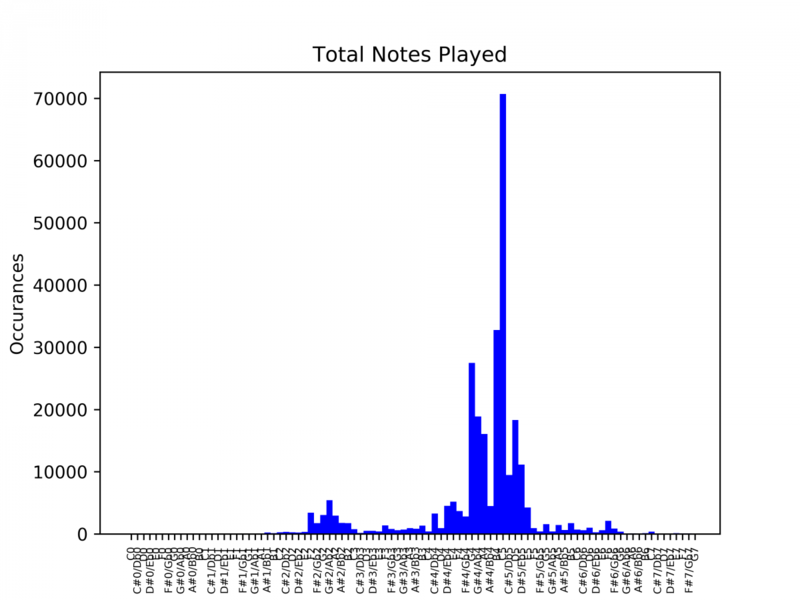 One way to find the most popular note is to generate a histogram, tallying the number of times each note was played. From this, a clear favorite emerges, C in the fifth octave. But why is the variance so extreme? Are people really playing C5 that much more frequently than any other note? My guess is probably not, and the reasons the data looks this way are likely a combination of the algorithm used to capture notes and the physical aspects of the microphone. MozART has to decide how to handle multiple notes being played at once, and the way it does this is to simply choose the one that was played loudest. Since the microphone was placed at the far right end of the piano, the higher octaves would have had a greater amplitude at the microphone. So then why isn't everything skewed toward the high octaves rather than the center? The microphone wasn't designed to pick up high notes, it was meant to record people. I would expect that it's much better at detecting frequencies in the human voice range of 80 to 255 Hz. This is a difficult question. We certainly can't know how many unique players there were, but we can take a rough guess at how many times someone sat down to play the piano. If you were to sit down at the piano and start playing, you'd probably continue playing pretty regularly until it was time to get up and leave, but it's possible you'd take a few breaks too. So how long might those breaks be? If we guess a time too short, we'll inadvertantly count two players when it was really just one who was briefly checking their phone. If the time is too long, then we'll miss the player who was waiting in line and sat down right after someone else. I'm taking a guess by choosing 60 seconds as the time required between notes to be considered a new player. So how many players does that give us? 7,943. Over 73 days that gives an average of 109 players per day. Finally an easy one. 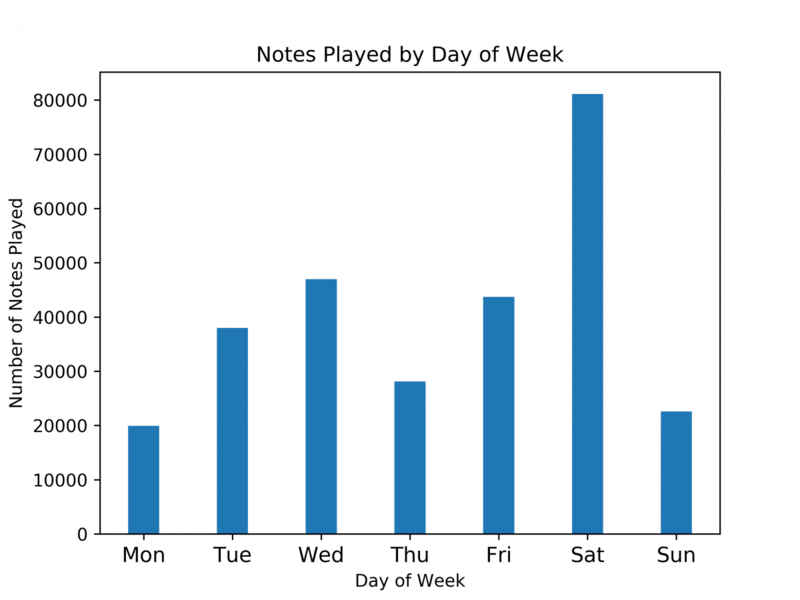 A bar chart of the notes played versus day of the week shows that Saturday and Wednesday are the most popular days, with Monday being the least popular. Sorry Monday. Real data is always fun to look at and it seems there's no end to what you can find. Feel free to look for your own patterns in MozART's log file. Thanks so much to the Academy Center of the Arts and Hill City Keys for their partnership in this project, and to Lynchburg's Arts and Culture Grant. You can read more about MozART, the synesthetic piano here. If someone said to me “Quick! Take a picture!” my first instinct would probably be to grab my smart phone. Before smart phones and digital photography, though, there was film. Film photography has been around for over a century, but, if you are like most people, you haven’t use film in a long time (if ever). A few fellow VS members and I recently explored the wonderful world of film photography. Using older cameras like these really forces you to slow down and take your time composing, manually focusing, and setting your exposure. With film, you don’t have the luxury of instant feedback on the shot you just took so you have to be patient. Using the Film Developer app works great to keep track of all the times for each step of the process. If you have a negative scanner such as the Epson V600 you can scan the negatives to get digital images. Armed with our processed negatives we were now ready to make our prints. For this we attended a Darkroom Photography class at the Academy Center of the Arts. In the darkoom, where we produced our prints, the only light available is a dim red light. We used enlargers to project light through a negative, producing an enlarged image on photo paper. The darkness of the image produced depends on the amount of time the paper is exposed to the image. You can zoom in on the image and crop by increasing the distance of the enlarger head from the easle. We were able to dodge (lighten) and burn (darken) the print by actually blocking light from some areas while letting it shine longer on others. After we exposed the paper, we put it through a series of chemicals similar to how we developed our negatives (developer, stop bath, fixer, rinse). Seeing the photographs appear on the paper (like magic) as it develops was absolutley amazing! We all had a great time producing some great photographs, handling each part of the process ourselves. We hope to setup our own enlarger and darkroom at Vector Space. Jeff and I are also looking into some interesting alternative developing agents like coffee and sage! I would like to thank Kelly Posenauer for setting up the Darkoom Photography class at the Academy Center of the Arts and Kenny Weinfurtner for being an excellent instructor in the darkoom. From July 23 to the 25, myself (Jeff) and Elise Spontarelli were invited by Cognizant to attend the Boy Scout National Jamboree as a part of the STEMQuest village in order to help facilitate the stations available for scouts. Among the activities available were drone flying with the new DJI spark, block programming with the BBC Micro:bit, CNC milling with Shopbot, soldering skills (led by yours truly) and screenprinting (led by Elise). Overall, there were several hundred scouts that passed under our tent in the day and a half that we were working, and a grand total of 50,000 scouts and staff in attendance for the whole 2 weeks. What was particularly impressive about the whole experience of being among all of these scouts was the willingness they had to learn and take apart things to figure out how to repurpose them in unique ways. One story we heard in fact, involved a student who was so energetic to take apart a laptop that he drilled directly into a laptop’s battery, causing a fire on the scrap electronics table. Thankfully while we were there the level of excitement was considerably less, but the amount of creativity demonstrated was unlike anything I’d ever seen from that age group before, and the level of skill demonstrated reshapes what I believe this age group can be capable of in the world of making. For one week in July, Vector Space was turned into a full service, bike-hacking, pedal zone. With donated bikes from Bikes Unlimited, Scene 3, The Bike Shack at Lynchburg College, and L. Oppleman, we had frames, handlebars, and chains for days. The camp was lead by myself and my husband Adam as well as Jawansa and Michelline Hall, the dynamic duo behind Blackwater Branding. On Monday students were introduced to our sponsors and the accompanying bike designs; each student chose their sponsor/bike combo and got to work planning. While the designs had a general direction, there were still several choices and modifications for students to decide on structurally, as well as all of the visual design elements. Over the next five days students brought their sketches to life. They rummaged through used bikes and tagged parts that they would use in their design, as well as marking where cuts and welds needed to be. Days two and three were focused on disassembly and reassembly; each student learned to use an angle grinder (and when to use each of the cutting, grinding, and sanding attachments), and finally: welding. Using a mig welder students tool recycled bike tube and square steel tube and joined them to create new bikes. 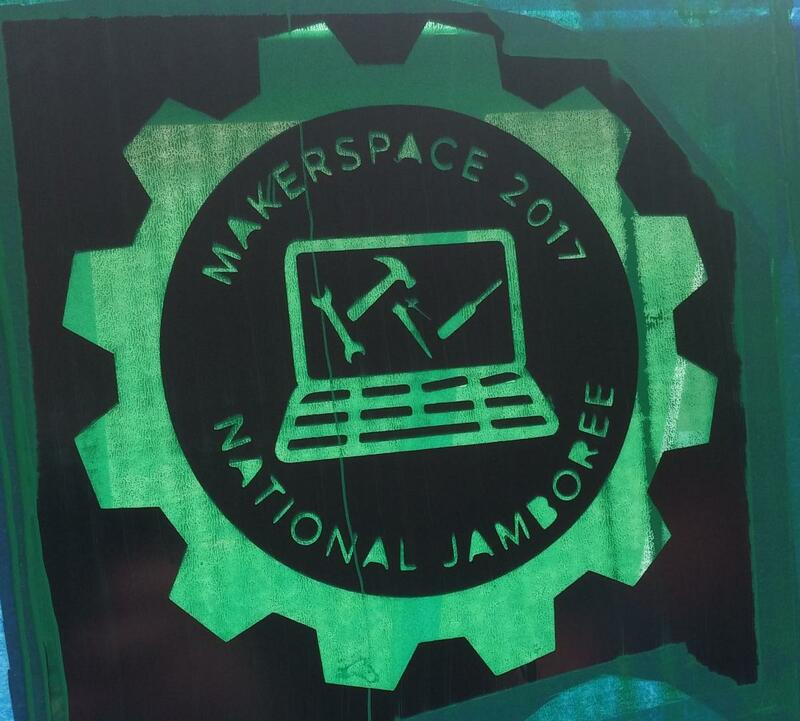 In the meantime, students were also working on visual design: vinyl cut stickers, paint colors, stencils, and sponsor recognition. The Halls taught spray paint techniques to create gradient effects and crisp, clean lines. Some students needed to build seats or other additional bike parts, and then it was time to put things back together. With an extra day for installing brake lines and pedals, they finished up and took their bikes for a test ride. The big reveal will be at Lynchburg's Get Downtown festival on September 8th from 6-9pm. The Vector Space booth will be on Main Street between 9th and 10th streets, in front of Favored Flavors. We invite you to come out and see the Pedal Parade, speak with the students, and maybe be inspired to do some bike hacking of your own! Last month I had the pleasure of working with several volunteers to build Lynchburg's first Little Free Pantry. The masterminds behind the project are Kristen O'Neill and Megan Huffman, who heard of a need and came to us at Vector Space for help. Tracey Dixon of Lynchburg Daily Bread had requested a pantry to provide access to food during non-business hours. While the Daily Bread serves lunch 365 days per year, those needing food during other times of the day can now access the free pantry. Several women volunteered to help, so we started our reseach at LittleFreePantry.org and used plans for a Little Free Library as the starting point for our design. Using 3/4" plywood we spent two evenings cutting the pieces on the tablesaw and then assembling them using wood glue and screws. Next we turned our focus to the door and roof. We added hardware, a vinyl sticker and paint to complete the visual design. We shingled the slanted roof to keep pantry goods dry. Mounting the pantry provided a challenge as we wanted it to be secure without having to drill into the sidewalk at Lynchburg Daily Bread. A 4" post in a concrete base proved to be sufficiently sturdy. During the build the News and Advance paid us a visit to learn more about the project. At the opening of the pantry Living in the Heart of Virginia interviewed myself and Tracey Dixon. We started a Facebook page and a group calendar for those interested in stocking the pantry. Within about a week of opening, the pantry had generous volunteers signed up to stock it every day through the end of 2017 (and beyond!). We are so thrilled and appreciative of the community support. Talks have begun about future pantries in and around Lynchburg. We have had groups and individuals reach out about a need for 24/7 food access in their area and a willingness to help. We look forward to working with the community to build more pantries, and encourage you to make your own. If you've build a Little Free Pantry or a Little Free Library, let us know! I would love to see your project. 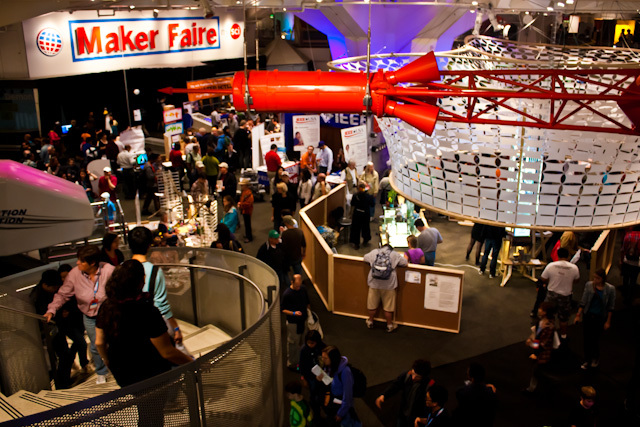 We are excited to announce a lineup of events for all ages during the National Week of Making. Sponsored by Innovative Wireless Technologies, Inc., our four events include a free meetup for educators, family workshop, college night, and escape room demo. Have you ever wondered how escape rooms seem to transport you to a different world? Learn how the expert makers at One Way Out come up with and execute their creative escape room ideas. 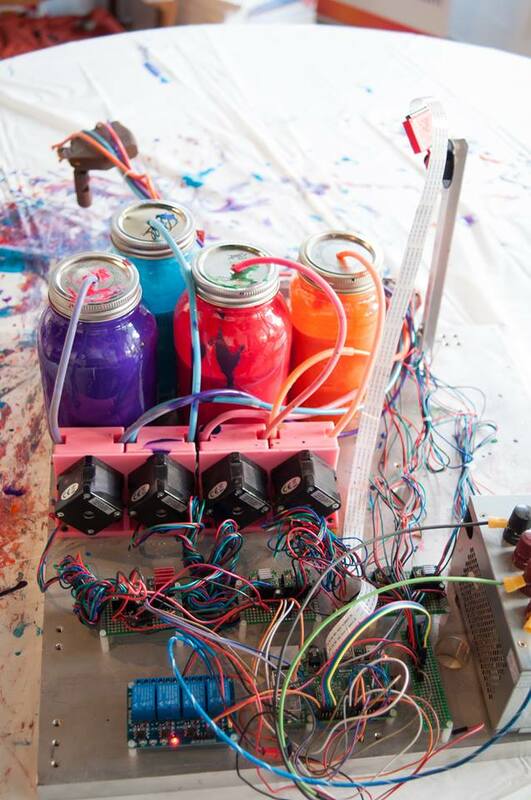 This $10 event includes a demonstration, Q&A, and a short hands-on activity. This is an evening for kids ages 8-12 and their caregivers to work together. Adults and kids will have unique tasks to complete as they work towards a common goal. Registration includes one adult and one child. 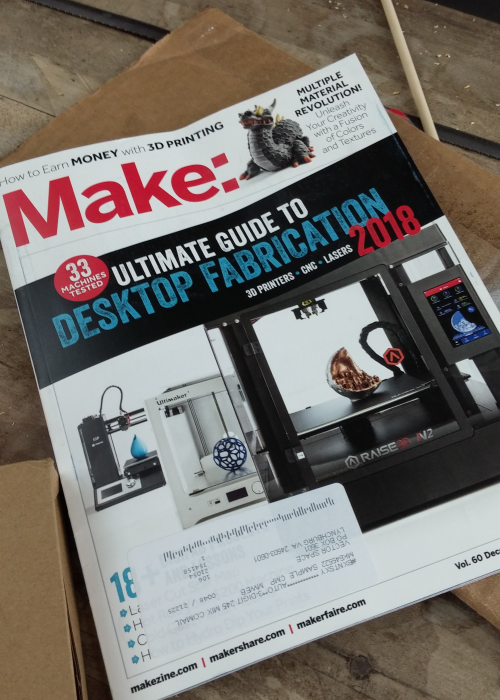 A free opportunity for teachers, librarians, and parents to discuss maker-based topics, pedagogies, ideas, and insights. We will create a Maker Map, share successes, get feedback on upcoming projects, troubleshoot ongoing issues, and mingle. Refreshments provided; registration requested. We welcome all college students to come explore Vector Space! Hear from your peers and what they're building at Vector Space, and get a tour of the facilities. Plus, free pizza! Week of Making at Vector Space is generously sponsored by Innovative Wireless Technologies, Inc.